The Hawaiian Island chain is a long string of islands that actually stretches for thousands of km. All of these islands were formed by the movement of the Pacific plate above a volcanic hotspot. As the plate is constantly slowly moving, it allowed volcanic islands to form and then carried them away so they would become extinct. There are 5 shield volcanoes on the Big Island of Hawaii, with Kilauea being the newest and most active. Kilauea is located on the Eastern edge of the Big Island of Hawaii. It rises only 1,247 km above sea level; a fraction of its neighbor Mauna Loa, which rises to 4,169 km. It’s classified as part of a family of low, broad volcanoes known as shield volcanoes. 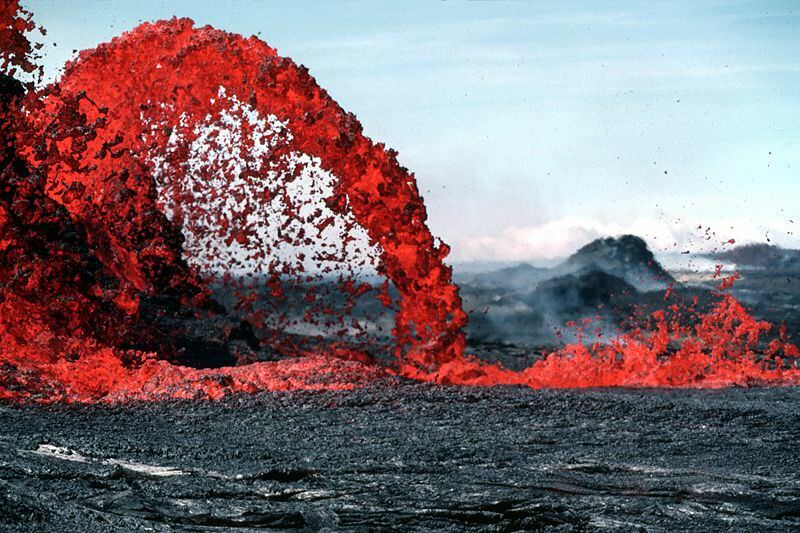 The basaltic lava that erupts out of shield volcanoes has a low viscosity which can flow for dozens of kilometers. While the other volcanoes on the island are extinct or dormant, Kilauea is in an almost constant state of eruption. Scientists used to think that Kilauea was a satellite volcano of the larger Mauna Loa, but better research has shown that Kilauea has its own magma plumbing system, starting more than 60 km below the surface of the Earth. Kilauea has almost continuous activity during the 19th century, and there were 34 eruptions since 1952. In January 1983, eruptions began along the east rift zone and haven’t stopped since. Kilauea is one of the most accessible volcanoes in the world. You can drive right up to it, park, and walk down a short trail to peer into the volcano crater. There’s even a lodge on the ridge that gives an amazing view of the volcano. One of the best ways to view Kilauea is by boat. Tours will take visitors just offshore, where hot lava is pouring out of Kilauea and into the Pacific Ocean. This creates huge plumes of steam. The inhabitants of the Hawaiian Islands believed that the goddess of volcanoes, Pele, lived in Kilauea. They thought that eruptions happened when their goddess was angry, and they developed many tribal chants to try and calm her down. Several unique lava formations are named after her, like Pele’s tears (small drops of lava that cooled in mid air during an eruption), and Pele’s hair (strands of volcanic glass). We have written many articles about volcanoes for Universe Today. Here’s an article about Mount Vesuvius, and here’s an article about Mount Etna.